Kevin Owens will be returning to WWE television in “one month or so,” according the man himself. Owens announced his upcoming return in a video that aired on Raw earlier this evening in which the former Universal Champ bowled with his family. “For the last four months, I’ve been recovering from my knee injuries and my recent surgery,” KO began. “And now I’ve been asked to update the WWE Universe on what I’ve been up to since I’ve been off, and truth be told, I’ve been doing a lot of this,” he added while gesturing to the lanes behind him. 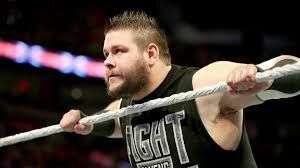 Owens then announced that his return to the ring was imminent: “One more month or so, before the Kevin Owens Show returns,” he said, before driving a bowling ball into the gutter.